World Trade Copiers has been meeting the needs of businesses throughout the United States for almost 30 years. First started in 1983, the company now has grown to multiple locations in four states along the east coast. 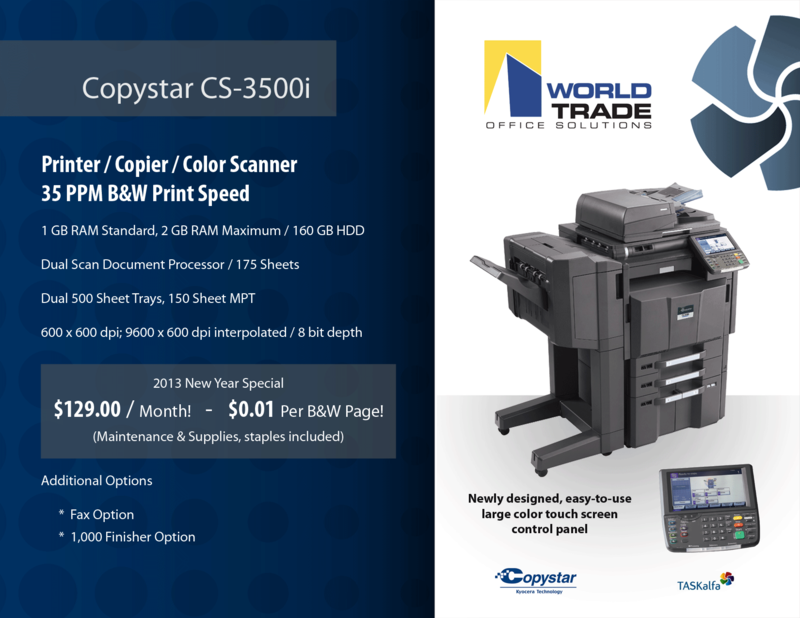 World Trade Copiers offers the latest in Color and B&W Copiers, the latest in scanning technology and all other office solutions with a wide range of leasing, purchase and rental options. Our company’s philosophy is to offer the advantage of steadfast reliability, unparalleled service and newest print technology available. Plain and simple: We don’t take your business for granted. A large amount of our business comes from repeat clients and referrals. We know this and we appreciate it. That’s what drives us and we ensure your satisfaction at all costs. To this end, service calls are always done within 4 hours. We also make sure to supply the most durable machines at the best price. Whether it’s the latest in copying or scanning technology, or just a simple reliable machine that you can count on, World Trade Copiers offers you unparalleled solutions. We’ve earned our reputation, and to keep it we need to put your needs first. World Trade Copiers Miami’s main product line consists of Kyocera Mita and Sharp, with a wide selection of award winning new color and B&W copiers. These brands have been recognized by the Buyers Laboratories’ and BERTL’s rating companies for their excellence in performance, customer satisfaction and reliability. Ask about our latest in scanning technology. South Florida has a high demand for refurbished equipment. Besides offering new Color and Black and White copiers, to accommodate the needs of our cost conscious customers, we also carry an extensive line of refurbished and used copiers for sale. We offer flexible financing for used equipment through our in-house financing program. You can get a used color or B&W copier for lease, for a considerable savings without compromising quality, thereby improving your company’s bottom line. All refurbished copiers from World Trade Copiers go through a rigorous internal inspection, cleaning and replacing all wearable components and an external reconditioning. Our refurbished copiers are virtually indistinguishable from their newer counterparts as far as appearance, output quality and reliability are concerned. We include a standard warranty and offer a low cost service agreement to guarantee the quality of all of our remanufactured equipment. Equipment rental is an ideal alternative to leasing, because of flexibility. You may need a rental for your company’s visit to South Florida, or you want to try a particular type of equipment before your make a long term commitment. We offer B&W and Color copiers for rent for as short as a few days or as long as a few months – you have the flexibility to choose. Our standard volume office machine rentals range from fax machines to printers and portable desktop copiers that are networkable and economical in space. 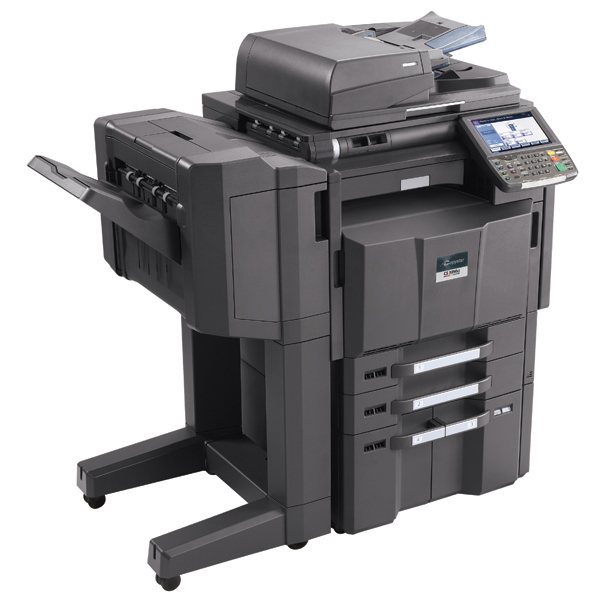 These commercial grade machines can handle moderate production and are configured to scan, fax and print. They are the right choice for an organization that needs a single machine in one location or several machines in multiple divisions. 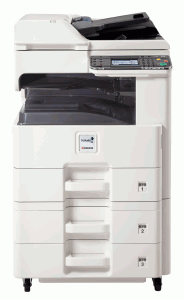 In our enhanced rental line we offer new copiers for rent as well. These copiers are in the 50 page per minute class. They are available in either color or black and white. 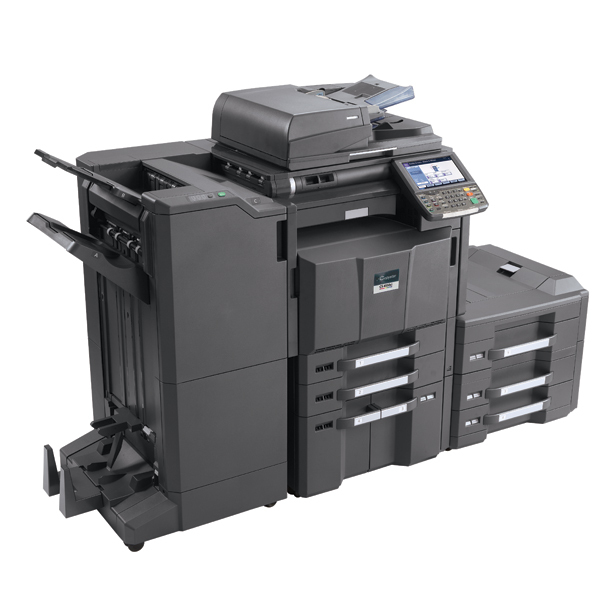 These copiers are networkable and perform scan and fax functions. For the cost conscious customers, these are simply the best. Our guaranteed 2-4 hour service response time to fix a machine malfunction will make sure that you experience only minimal downtime. World Trade Copiers prides itself on taking care of the customer above all! We are committed to providing you with an experience that is pleasant and absolutely hassle free. Our goal is to serve you, our customer, by offering sales, service, and rentals to cover all aspects of your office’s document needs. In so doing, we can both excel.